If the birding world had a rock star, it would be the hummingbird. Swift, tiny, secretive and simply amazing to watch, "hummers" are so hard to spot that catching a glimpse of one can be a summer experience you'll long remember. But you don't have to be an avid birder to be thrilled by the sight of a hummingbird. Hummingbirds can be found across the country, with ruby-throated hummingbirds common east of the Rocky Mountains and a dozen or more species common in western regions. To maximize your chances of seeing a hummingbird this summer, take a few simple steps to attract hummingirds to your backyard, where you can enjoy them at your leisure. In spring, hummingbirds return from their tropical winter retreats in Central and South America, and this is the best time to attract them to your backyard. Like all wild birds, hummers have three basic requirements to make a place their home - access to hummingbird food, water in a bird bath and a good nesting spot. Offering nectar-rich flowers and hummingbird feeders is a good start. But you also need suitable habitat that provides sheltered perches and good nesting places, encouraging females to raise their young. Research shows that these tiny birds have a remarkable memory and frequently return to the same hospitable sites on the same day of each year. If you feed consistently, you may have return visitors, especially during spring and fall migrations. If you can get them to nest nearby, too, you'll have fledglings who also may remember your address in years to come. Female hummers typically settle in deciduous trees over a clearing or stream. They fashion their nests from sticky spider webbing, using lichen to camouflage the exterior and soft plant fibers to cushion the interior. It's probably not practical for the average hummingbird fan to stock spider webs and lichens in their yard. But there is a man-made alternative. 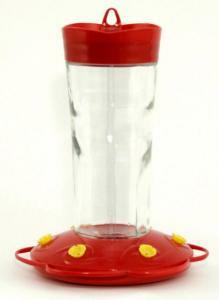 Hummer Helper is the first commercially available product that has proven appealing to hummingbirds. Introduced by Songbird Essentials, the all-natural material (specially processed with oil left in) is contained in a wire frame painted red to attract a hummingbird's eye. The product is endorsed by the Hummingbird Society, an Arizona-based advocacy group. In the March 2009 edition of the society's journal, Executive Director Ross Hawkins reported watching females at work gathering the material. "We recommend 'Hummer Helper,'" he wrote. "It has the potential to help bring in more hummers, close by where you can observe them, and to increase the odds that they will nest near you." To start attracting hummers, hang a small hummingbird feeder. Nectar mixes are available, but it's easy to make your own. Use four parts tap water to one part ordinary table sugar, heated until dissolved. Red coloring isn't necessary. Increase the visibility of new feeders by hanging red ribbons nearby. The hummingbird's high metabolism drives it to feed about every 10 minutes, and it examines every square yard in its range for food, experts say. Keeping the feeder clean and the nectar refreshed is critical. Spoiled solutions can turn to alcohol and support mold, both harmful to the tiny birds. In cool weather, fluid can be left for five to seven days, but during hot spells it should be replaced every two days. For easy cleaning, pick up a specialized brush like Songbird's "Best Hummer Brush." Don't use soap or detergents, which can be hard to rinse thoroughly. A solution of ordinary white vinegar is a good non-toxic cleaner. Two other handy accessories are a water-filled nectar protector ant moat, hung above feeders to keep ants at bay, and an overhead protector like Songbird's Hummer Helmet to keep rain water from diluting nectar solutions. While its shade helps keep nectar fresh longer, the red color acts as a big red "Food Here" sign.